How much does your financial future depend on a 140-character Trump tweet, stroke of a pen on an Executive Order, or an off-hand comment to a reporter? As you can see, when President Trump tweets or speaks, the markets react – in some cases violently. We are in uncharted waters. We have never had a president like Trump. We’ve never had an administration like Trump’s. There is no historical precedent for this. What none of us knows is what to expect in terms of unintended consequences. What will be the potential impact on bond markets and interest rates? What is the risk of trade wars, currency wars, and U.S. relations with Russia, China, the Middle East, or North Korea? Was Trump’s Election a “Black Swan Event”? A “black swan event” is an event in human history that was unprecedented and unexpected when it occurred. By that definition, Trump’s election was a black swan event. The idea of a black swan event was introduced by former Wall Street trader, Nassim Nicholas Taleb, as the 2008 financial crisis unfolded. The dot-com bubble of 2000 is another black swan event with similarities to the 2008 financial crisis. So here’s a quick quiz for you: How much did the markets lose in the aftermath of those two crashes? If you don’t remember, you’re not alone. As the behavioral finance experts have observed, we human investors typically forget about our losses and mentally exaggerate our successes. Going back just 17 years, many people saw their investment accounts plunge by 50% or more when the dot-com bubble burst. And many investors had moved their money into NASDAQ technology stocks, which plunged 78% over 19 months. In the most recent market crash, the S&P 500 lost 57% over an 18-month period. To add to the concern, in the last 100 years, there has never been a two-term presidency end that wasn’t followed by a recession within 12 months. Didn’t we all feel like we were sitting real pretty right before the crash of 2008 (and the crash of 2000)? Then we discovered – yet again – that what goes up fast usually comes down fast, too. The stock and real estate markets did just that – with a resounding thud, and took the retirement security of millions of Americans with them. If you think you can relax and coast until retirement because of the sky-high numbers on your retirement account statements, then you have forgotten the lessons of the last two crashes (and the crashes that came before them). Your investment account statements, 401(k) and IRA statements, real estate appraisals and business valuations are nothing more than pretty numbers on paper. And those numbers repeatedly sucker many of us into believing we have real wealth and financial security when we do not. Key Point: You don’t actually lock in any profit until you sell an investment and lock in (hopefully) any gains. Until then, you have only a paper profit, which can vanish in the next market crash. Real wealth, on the other hand, doesn’t disappear when the markets crash. And, as we just discussed, your investment accounts, retirement plan balances, real estate appraisals and business valuations all represent paper wealth. So, what asset represents REAL wealth, that doesn’t disappear when the markets crash? A Bank On Yourself-Type Supercharged Dividend-Paying Whole Life Policy Is Real Wealth! Your principal AND growth are locked in – even when the markets are tumbling. This is an off-Wall-Street strategy. Dividend-paying whole life has increased in value every single year for more than 160 years. Even during the Great Depression and Great Recession. Your annual statements represent real wealth, which you can access how and when you want – without having to beg for it or ask permission to use it. Dividend-paying whole life insurance is the best way to build a solid financial foundation that can help you weather whatever challenges life throws at you. And the supercharged variation that’s used for the Bank On Yourself concept builds cash value significantly faster and lets you take an income stream in retirement with no taxes due on it, under current tax law. 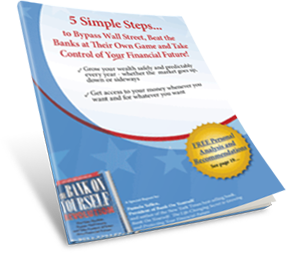 It’s easy to find out how adding the Bank On Yourself method can help you reach your financial goals and dreams – without taking any unnecessary risks. Just request a FREE Analysis. You’ll also get a referral to one of only 200 advisors in the U.S. and Canada who have met the rigorous training and requirements to be a Bank On Yourself Authorized Advisor. So why not request your free, no-obligation Analysis NOW, while it’s fresh on your mind?